Based on the beloved Disney animated film from 1992, the “Aladdin” musical kept some of the film’s charm despite production flaws. The Broadway musical took center stage at Shea’s Performing Arts Center from Aug. 8 to Aug. 19 for a two-week run at the popular local venue. The musical’s Middle Eastern style, production and costume design paralleled the extravagant beauty within Shea’s Theater. The costume and set designs contrasted between the constant golden imagery with rich colors and fabric. Lucie Peterson, a junior exercise science major, grew up on the animated “Aladdin” film. The production also featured multiple visual effects. Following a show-stopping performance of “Friend Like Me,” small stage fireworks shot out to frame the posing cast in light. Similarly, the cast performed the entirety of “A Whole New World” while on top of the magic carpet, framed and lit to imply the actors were really flying. The classic Disney story is overhauled to accommodate the transition from animation to live-action, all while attempting to stay faithful to the original content. Rather than produce a scene-for-scene remake of the animated film, the stage production introduces a slew of new characters and character developments. The most notable change between the two mediums is the replacement of Abu the monkey and Rajah the tiger. These two iconic characters are replaced with three male friends and three female friends, respectively. This alteration is questionable, considering the shift in the characters’ social dynamic. The flaw rests heavily on the character of Aladdin. The audience is constantly reminded of Aladdin’s ‘heart of gold’ through blatant scenes, yet his character does very little to help his friends. It is implied that the relationship between the four boys is very brotherly because of their upbringings, yet Aladdin chooses to ignore his responsibility to them in order to win over Princess Jasmine. The three friends are not even aware of the genie until the final few scenes of the production. This negligence contrasts the relationship between Aladdin and Abu within the animated film. Although it paralleled a friendship, the ‘animal sidekick’ trope relies on the human companion regardless. The film uses Aladdin’s relationship with Abu along with the ‘heart of gold’ exposition scenes to make his character seem redeemable for lying throughout the film. This idea does not come across in the stage production. The stage show features familiar hits from the animated film such as “One Jump Ahead” and “Prince Ali," but also includes new songs written solely for the stage production. Many of these new songs are set up for the characters introduced within the show. The new songs served as both filler and exposition, which ultimately didn’t make them very memorable. Tony Rezemek, a resident of Cheektowaga for fifty four years, travelled with her granddaughter to see the performance. Still, another critical flaw with the performance and writing is the pacing. The production features multiple themes and ideas that are never fleshed out to the extent of being significant, which leads to the overabundance of filler. An example of this is Aladdin’s expository song “Proud of Your Boy,” where Aladdin sings about his deceased mother. This song is reprised once more at the end of the second act, but Aladdin’s mother is never brought up again. The climax of the animated film occurs when Jafar’s character steals the lamp and begins his reign of terror over the city of Agrabah. Within the stage production, Jafar interrupts Aladdin and Jasmine’s wedding, hell bent on becoming sultan. Within a one-minute song reprisal, Jafar exposes Aladdin as a liar. Aladdin then immediately tricks him into wishing he was a genie within two lines of dialogue. Within three minutes, the climax of the entire production is over. Despite the production flaws, many people were awestruck by the production. The cast received a standing ovation following the performance. 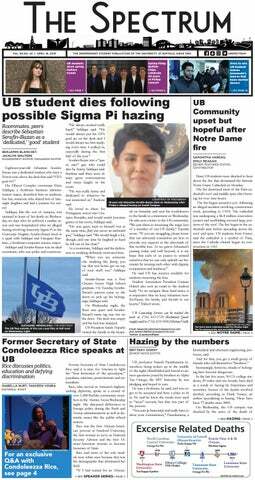 Samantha Vargas is the assistant arts editor and can be reached at sam.vargas@ubspectrum.com.